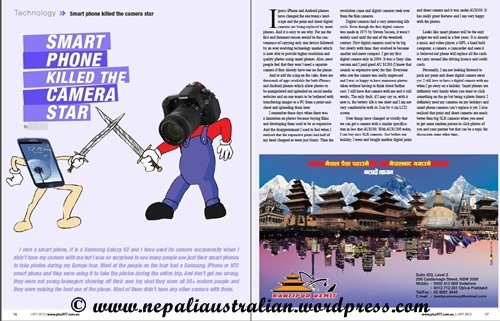 This article was published in +977 (a Nepalese Lifestyle Magazine in Australia) in July-Aug 2012 issue. I own a smartphone, it is a Samsung Galaxy S2 and I have used its camera occasionally when I didn’t have my camera with me but I was so surprised to see many people use just their smartphones to take photos during my Europe tour. Most of the people on the tour had a Samsung, iPhone or HTC smartphone and they were using it to take the photos on entire trip. And don’t get me wrong, they were not young teenagers showing off their new toy but they all were 50+ mature people and they were making the best use of the phone. Most of them didn’t have any other camera with them. I guess iPhone and Android phones have changed the electronics landscape and the point and shoot digital cameras are being replaced by smartphones. And it is easy to see why. For me the first and foremost reason would be the convenience of carrying only one device followed by an ever evolving technology market which is now able to provide higher resolution and quality photos using smartphones. Also, most people feel that they won’t need a separate camera if they have one already on the phone. And to add the icing on the cake, there are thousands of apps available for both iPhones and Android phones which allowed photos to be manipulated and uploaded on social media websites and no one wants to be bothered with transferring images to a PC from a point-and-shoot and uploading them later. I remember those days when there was a limitation on photos because buying films and developing them was so expensive. And the disappointment I used to feel when I realised that the expensive prints had half of my head chopped or were just blurry. Then the revolution came and digital cameras took over from the film cameras. Digital cameras had a very interesting life cycle. Even though the first digital cameras was made in 1975 by Steven Sasson, it wasn’t widely used until the end of the twentieth century. First digital cameras used to be big but slowly with time, they became small and compact. I got my first digital camera only in 2004. It was a Sony slim version and I paid good AU $1200 (I know that sounds so expensive now) for that. Everyone who saw the camera was really impressed and I was so happy to have numerous photos taken without thinking about further cost. I still have that camera with me and it still works. The only fault with it now is, the battery life is too short and I am not very comfortable with its 2cm by 4 cm LCD screen. Now things have changed so quickly that we can get a camera with a similar specification in less that AU$100. With AU$1200 today, I can buy nice SLR cameras. Just before our holiday, I went and bought another digital point and shoot camera and it was under AU$300. It has really great features and I am very happy with the photos. Looks like a smartphone will be the only gadget we will need in a few years. It is already a music and video player, a GPS, a hand held computer, a camera, a camcorder and soon it is believed our phone will replace all the cards we carry around like driving licence and credit cards. Personally, I am not looking forward to pack my point and shoot digital camera away yet. I still love to have a digital camera with me when I go away on a holiday. Smartphones are definitely very handy when you want to click something on the go but being a photo fanatic I definitely need my cameras on my holidays and smartphone cameras can’t replace it yet. I also realised that point and shoot cameras are much better than big SLR cameras when you need to get some random person to click photos of you and your partner but that can be a topic for discussion some other time. 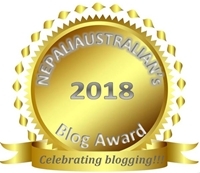 This entry was posted in Published, Technology and tagged +977, +977 magazine, +977 Nepalese Australian magazine, gadgets, htc smartphone, iphones, plus977, point and shoot digital cameras, technology. Bookmark the permalink. The funniest alternative to a real camera I’ve seen is a tourist holding up their iPad to take the pictures, haha.